Simple but Staple Beauty Tips! – Whenever you wear any tip of face makeup you always want to set it with a powder. This will ensure that your foundation and concealer will stay on all day. You also always want to use powder if your face gets oily throughout the day. A powder is made to lock in your foundation and concealer and to matte out that shine from the oils in your skin, to make your skin flawless and oil free. – Whenever you are doing your makeup you always want to look more awake. Ways to do this is by adding light to your face. There are many ways you can do this for the various places on the face that you can highlight. The place you want to mostly focus on highlighting is your eyes. A few ways to highlight your eyes is by using any type of eyeshadow that is a shade or two lighter than your skin color and is a little shimmery and place that under your brow bone and also in the inner tear duct of your eye. The second way to highlight your eyes and make you look more awake is to add a white eyeliner to your waterline. This is going to make the whites in your eyeball stand our and look whiter than ever! The last most important way to make you look wide awake is by putting a concealer under your eyes that is either a shade lighter than your skin or is a highlighting concealer! – Sometimes its hard to find that one mascara that gives you the fullness that you want in your eyelashes. A way to get fuller lashes is by adding a black eyeliner to your tight line. When you usually apply your mascara it lifts your lashes and you can see your tight line and so you can kind of see that it is your skin so it makes your lashes appear smaller. When you add the black eyeliner to the tight line it is going to make it so when you apply mascara and it lifts your eyelashes you will see that line of the black eyeliner instead of just your skin. – Some people always want fuller lips but don’t know how to achieve that. One way to get fuller lips is to use your toothbrush and just go in circular motions on your lips before you apply any lipstick or lipgloss. Then after you do that with your toothbrush and you have applied your lipstick, take a lipgloss and place it in just the center of your lips. This will make the light only hit the center of your lips and give the illusion of fuller lips. First I just wanna say that I am extremely sorry this post is late and that I haven’t been posting recently. I have just been so buisy. So the nail polish of the day is by O.P.I. Sadly I got my nails done at a salon and they didnt have the nail on the bottom of the bottle so I am not sure what the name of this color is. I love this color though and its great since fall and winter are on their way. 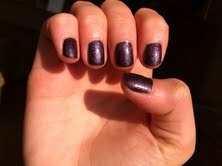 This color is a shimery color but what I like about it is that it is opaic enough that you only need one to two coats! It looks amazing in any like because you can always see the shimmer on the nails! I ot tons of compliments when I wore this and everyone was asking what the color was becasue they loved it on! Here is a picture of it in the sun. Even in the sun it looks amazing becasue the sun reflects off the shimmers. Even though it isn’t quite fall or winter yet I still love ths color. Although it would look ten times better if you wore it at the end of fall, beginning of winter since it is a dark shimmery purple. Anyways I love this color alot and I think if you can find a simalar color, since I don’t know the name of this one, for fall and winter, it would be amazing! The nail polish of the day is O.P.I. Princess’ Rule. I love this color especially for the summer. It’s a light, almost frosty shimmery pink color. This nail polish also looks great on top of other nail polishes. It looks good on top of pretty much any color you want. It looks really good on pinks. I wore this color by itself and its not very pigmented to go by itself so it took me about 3 to 4 coats of this polish to get a pigmented color. Since you put a lot of coats your using up a lot of product, so if you don’t want to use up that much of the polish then you could always put a coat of white on first and then you would probably only have to do 2 coats of this color. Even though I had to put a lot of coats on, I still love this polish and got lots of compliments on my nails throughout the days. 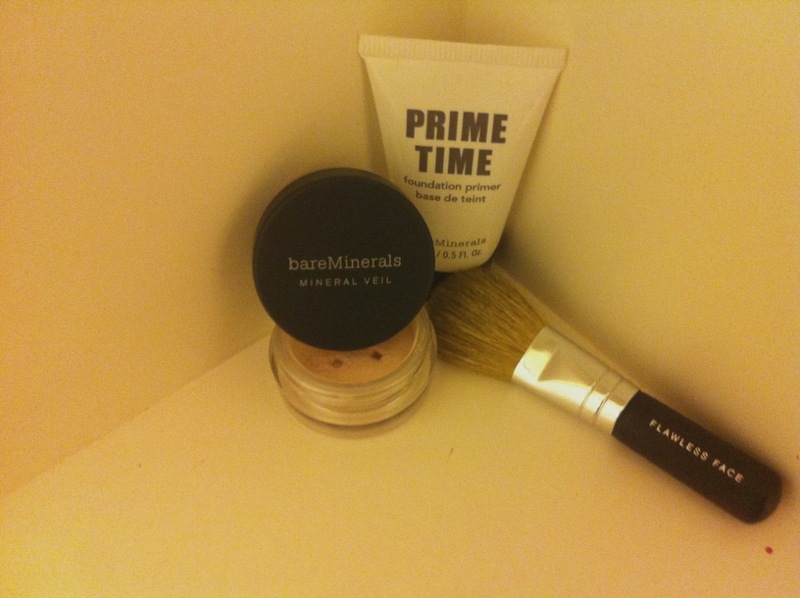 One of my favorite high end makeup brands is bare minerals. I love their stuff and am getting more and more things from there. 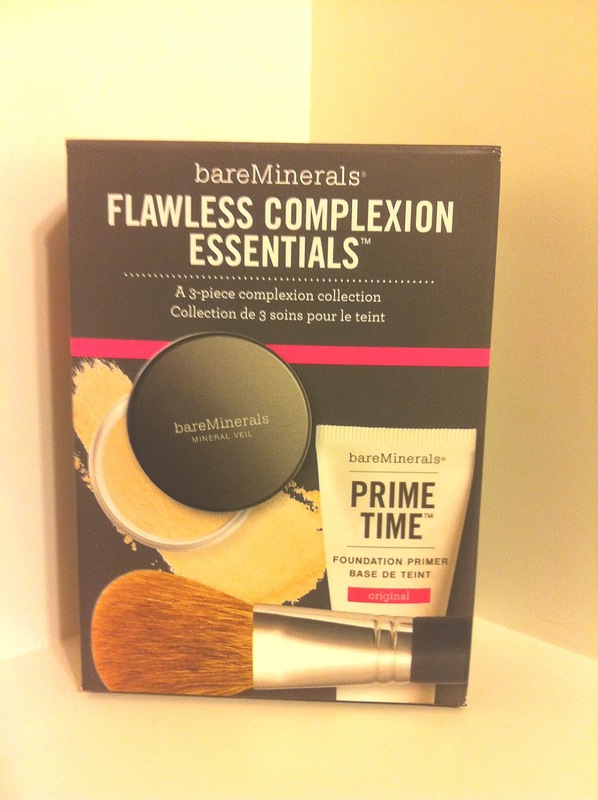 The other day I went to the actual Bare Minerals store and bought this. I love how at Bare Minerals they do lots of sets and so I usually get sets whenever I go. This is a set that came with a mini face brush, which I use for highlighting and contouring my cheeks, a mini mineral veil powder, and a mini face primer. I believe that this set was $15. Another thing I love about Bare MInerals is that their individual products are usually between $15 and $28 for one product but with their sets they are usually very cheap and its like the amount of money of one of the many things you got in the set. I just wanted to show you guys what I picked up and I will be having a Bare Minerals review on their brand and every product I have from them, very soon! So look out for that and I hope you enjoyed! This is my thoughts on a new foundation I tried out! Overall I loved it and recommend it to all of you! 1. Highlighter – Using a shimmery highlighter on your cheek bones just lightens up your face and makes it glowy. The sun reflects off the highest points of your face and since your cheek bones stick out a little the sun hits thereand if you highlight your cheek bones the sun will reflect off of it and make your skin look refreshed and glowy. 2. White liner – If you use white eyeliner on your waterline it blends with the white of your eyeball and makes the white part of your eye pop and be even brighter. Also if you put it in your inner corner it makes you look more awake. 3. Bronzer – For the summer everyone loves to have tan glowy skin. When your using a bronzer maybe try one with a little bit of shimmer so it makes it look glowy and tan and just awakens your face. 4. Light Concealer – Everyone loves to use concealer to make your face look even more flawless. We like to use it under our eyes and on our blemishes to conceal everything. When using the concealer under your eyes, a great tip is to use a concealer that is a shade lighter than your facce. This is going to lighten your face and make it look moreawake and will bring more attention to your eyes. 1. Less Heat – Try avoiding using lots of heated tools on your hair. Since it’s summer it’s even more important to use less heat on your hair because the sun can also damage your hair from it’s heat. Using a lot of heat on your hair will slow don its growth process. Try letting your hair air dry instead of using a blow dryer, or instead of using a heated curling iron, use heatless rollers for your hair if you want it curly, or you can even just go natural. 2. Eat Healthy – Try to eat healthier because if you eat healthier it actually helps with your hair being healthy looking as well. Iron deficiences cause hair loss and it’s proven that most women with healthier hair are lower on iron. 3. Hair, Skin, and Nails Vitamins – Any vitamins would be great just so that you are getting all the things you need to keep your hair healthy but I have heard and seen many reviews on a specific type of vitamin that lots of women have been taking called Hair, Skin, and Nails Vitamins and that they have all seen a difference in their hair, skin, and nails. 4. Don’t Brush Wet Hair – You want to try to avoid brushing your hair when it’s wet because when your hair is wet it is very vulnerable and fragile so it is easier for hair breakage to happen. A better way to get out tangles after your shower when your hair is wet, is to use a wide-tooth comb. This is better then a brush because a brush has many teeth and when you use that to brush your hair the teeth pull at the hair until it breaks.